Shipment volume of cable, IP (Internet Protocol), OTT (Over-The-Top) STB (Set Top Box) in Taiwan reached nearly 20 million units while shipment value stood at US 2.5 billion in the first quarter of 2017 2017, according to MIC (Market Intelligence & Consulting Institute), a Taipei-based IT research institute. "Of three kinds of STBs, OTT STB shipments outperformed or others with 18.4% year-on-year growth in the first quarter, bolstered by the increase in shipments of mid-range and high-end models for brands like Amazon, Roku, and Google, and the increasing demand in the Chinese OTT market," says Tzu-Yi Kao, industry analyst with MIC. "MIC predicts shipment volume of cable, IP, and OTT STB industry in Taiwan will grow over 8% year-on-year in the first half of 2017." 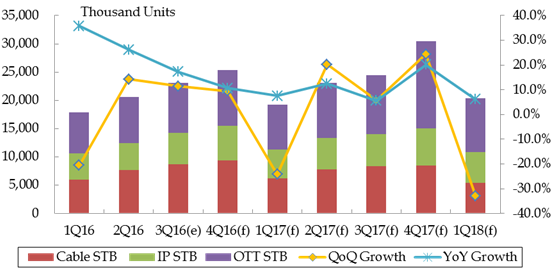 "IP STB shipments also witnessed nearly 10% year-on-year growth in the first quarter of 2017, owing mainly to stable orders placed by tier-2 and tier-3 telecom operators. Among them, cable STB shipments however declined slightly year-on-year due to the slowdown in the cable TV subscriber numbers that dragged sales of cable STB operators."